What makes your company a leader in armored car transport? Our state-of-the-art military and police tactical vehicles allow the military and law enforcement organizations an optimum level of security in high threat situations. Swat-vehicles.com has long been a resource for these organizations, and our reputation for advanced design and superior engineering and technology precedes us. Look to us for the very best in armored cars and armored trucks including Rapid Deployment Vehicles, Ballistic Armored Tactical Transport (BATT) Vehicles, and a host of other tactical options to protect those in the line of fire. We have been at the forefront of our industry for decades, creating armored cars that address the specific needs of our clientele. We will learn everything there is to know about our organization’s operational procedures so that we can custom design the exact vehicle you need. We are proud to be a friend of the military and law enforcement, and are proud to help them to carry out their all-important work. The stakes couldn’t be higher than they are for military and law enforcement units who so often find themselves in the line of fire. In such instances, the men and women serving in these units need to know that the vehicles they are deployed in offer the utmost in protection. The fact that we have established long-term relationships with many military and law enforcement organizations speaks to the type of protection we offer when the chips are down. If your military or law enforcement organization is looking to upgrade its tactical armored vehicles, Swat-vehicles.com should be your first call. You may reach us at (602) 840-2271. 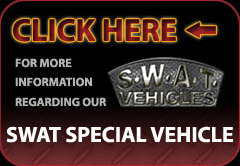 You may also get a free quote online at http://www.swat-vehicles.com/get-a-quote.php. Let us show you a level of security you never knew possible for the vehicles you deploy.